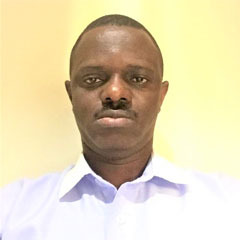 Dr. Olalekan S. Alade joined the Petroleum Engineering Department, KFUPM as a Postdoctoral Researcher in May 2018. He holds a Ph.D. degree in Earth Resources Engineering from Kyushu University, Japan (2017), with specialties in hydrocarbon resources production. His research experiences span thermal and non-thermal methods for heavy and extra-heavy oil (bitumen) recovery, production, and transportation, heavy oil extraction from oil sand and upgrading. During his doctoral studies, he worked in collaboration and shared research information with the Kuraray Company, Japan, and Japan Petroleum Exploration Co. Ltd. Dr. Alade is an active member of SPE and was a recipient of the SPE Star Fellowship Award between 2013 and 2016. O.S. Alade, K. Sasaki, B. Ademodi, Y. Sugai, K.T. Konadu, E.A. Owusu, R. Ueda, Kinetics of Thermal degradation of a Japanese Oil Sand. Egyptian Journal of Petroleum,Elsevier, DOI: http://dx.doi.org/10.1016/j.ejpe.2017.08.001. O.S. Alade, K. Sasaki, Y. Sugai, B. Ademodi, M. Nakano, 2016. Bitumen Emulsification using a Hydrophilic Polymeric Surfactant: Performance Evaluation in the Presence of Salinity. Journal of Petroleum Science and Engineering, Elsevier, 138: 66-76. J. Kumasaka, K. Sasaki, Y. Sugai, O.S. Alade, M. Nakano, 2016. Measurement of Viscosity Alteration for Emulsion and Numerical Simulation on Bitumen Production by SAGD Considering In-situ Emulsification. Journal of Earth Science and Engineering, 6, 10-17. DOI: 10.17265/2159-581X/2016.01.002. O.S. Alade, B. Ademodi, K. Sasaki, Y. Sugai, J. Kumasaka, A.S. Ogunlaja, 2016. Development of models to predict the viscosity of a compressed Nigerian bitumen and rheological properties of its emulsions. Journal of Petroleum Science and Engineering, Elsevier, 145:711-722. O.S. Alade, K. Sasaki, A.S. Ogunlaja, Y. Sugai, B. Ademodi, J. Kumasaka, M. Nakano, R. Ueda. 2016. Thermal tolerance and Compatibility of NaOH-Poly (vinyl alcohol) in Bitumen Emulsification for Improved Flow properties. Energy and Fuels, ACS (DOI: 10.1021/ac.energyfuels.6b02060). O.S. Alade, K. Sasaki, Y. Sugai, B. Ademodi, J. Kumasaka, R. Ueda, 2017. Effect of emulsification process conditions on the properties of water-in-bitumen emulsion. Journal of Japanese Association for Petroleum Technology, 2: 156-165. S. Ogunlaja, O.S. Alade, 2017. Catalysed oxidation of quinoline in model fuel and the selective extraction of quinlline-N-oxide with imidazoline-based ionic liquids. Egyptian Journal of Petroleum,Elsevier, DOI: http://dx.doi.org/10.1016/j.ejpe.2017.02.004. Ademodi, O.S. Alade, S.O. Abolarin, S.O. Adelakun, 2014. A Preliminary Investigation on Cyclic Steam Stimulation Recovery of Nigerian Heavy Oil. Society of Petroleum Engineers (SPE), Lagos, Nigeria. doi:10.2118/172362-MS. June, 2014. O.S. Alade, W. Cong, Y. Sugai, K. Sasaki. Experimental Study and Simulation of Gasification Characteristics of Low-Rank Coal by Rapid heating under CO2-rich Condition. Accepted October, 2017 in Journal of Applied Research and Technology, Elsevier.